Communication is sharing information between two or more individuals, the act of conveying information. Communication has so many components, and failing to communicate in the workplace effectively is commonplace. Effective communication requires all components of a communication interworking perfectly for “shared meaning,” my favorite definition of communication. It is of particular importance when questions are asked and answered. The individual sending the message. The sender must present the message clearly and with enough detail so that the receiver shares meaning with the sender. The context for the message. The context is how the message is delivered by the sender of the message. Context involves nonverbal communication such as gestures, body language, facial expressions, and elements such as tone of voice. Most of the context for a message is only available when the receiver can see and hear the message sender. Email and IM emoticons, for example, are a poor substitution as the sender formulates them without input from the receiver. Another piece of the context is the emotions that are involved in the communication circle. Is the sender angry? Is the receiver indifferent to the content of the communication or disdainful of the sender? Normal human emotions affect whether a message is successfully shared. The person receiving the message. The receiver must listen carefully and intently, ask questions for clarity, and paraphrase to ascertain that the receiver shares meaning with the sender. If the receiver trusts the sender, the chances for effective communication increase. The delivery method you choose. The delivery method should be selected based on the medium most effective to convey the meaning of the message. Since communication methods are so diverse since the dawn of computers and mobile devices, decisions about the delivery method have become more complex. The delivery method must suit the communication needs of both the sender and the receiver. Communication methods include verbal communication, instant messages (IM), email, letters, signs, posters, videos, screenshots, telephones, notes, forms, written documents, and more. These methods will continue to expand, and employee expectations for instant communication about everything having to do with their work will continue to grow. In-person communication has increased in importance especially for organizational information that might call for change, provide employee recognition, or allow for on-the-spot questions. In-person communication is also favored because employees have access to the component, context. The content of the message. The content of the message should be clear and presented and described in enough detail to obtain understanding from the receiver. If the message content resonates and connects, on some level, with the already-held beliefs of the receiver, it is most effective. James O. Pyle and Maryann Karinch add the following to aid effective communication. From human resources to customer service, bad questions pollute nearly every workplace. Bad questions often prompt incomplete or misleading answers and can undermine rapport. On the other hand, good questions are a valuable tool of efficiency, competence, and rapport-building. Direct: You pose a simple question with a basic interrogative. Control: You already know the answer to it when you ask it. It’s a way of finding out whether or not the person is lying, uninformed, and/or not paying attention. Repeat: You ask two different questions that are after the same information. Persistent: You ask the same question in different ways to explore all facets of the desired information. Summary: You ask a question that is intended to allow the source an opportunity to revisit the answer. Non-pertinent: It doesn’t pertain to the subject you want to know about, but it’s one the person will probably not lie about; it serves the purpose of seeing what the truth “looks like” and getting the person to open up to you. It can also tie into the context of the questioning exchange. Direct questions are the best: One interrogative, one verb, and one noun or pronoun. When do you say, “I’m deliberately not going to ask a direct question?” When you check the truthfulness or accuracy of a response, then you use a control question and look for consistency. Control questions are deliberate questions that you know the answer to so they are not about the discovery of information. They are about the discovery of behavior, patterns of speech, and level of truthfulness or accuracy. Perhaps it’s something you talked about before with the person. If you know that someone on your human resources team alienated an employee because the employee sent an email to complain about the person, you might ask a control question like, “How did it go in the performance review with Pamela today?” You already have the information; you just want to find out how your HR person answers the question. He might respond, “22,” which is a way of confirming the number of personnel on the sales force. It’s not an absolute test, but it gives value and credence to what he said before. They are two different questions that cross-check the information provided. In using repeat questions, you may also uncover discrepancies. If your source in this example responds that there are 28 sales regions, you would want some clarification. Maybe there’s a perfectly good reason — the sales force normally has a complement of 28, but there has been so much turnover lately, that they are six short — but the response does give rise to doubt the fact that there is a mismatch between the number of personnel and the number of sales territories. That mismatch must lead to further questioning to resolve the issue. In any exchange in which more than one answer might be given to a question, use persistent questioning to get a complete answer. Like repeat questions, persistent questions are also useful if you suspect that the person is not truthful. Bypassing that repeat question and going straight to questions about Disneyland means that you miss the opportunity to get a complete picture of your friend’s California trip unless that information happens to leak out at some other time. You sell cars of all kinds, from two-door hatchbacks to full-size luxury models. A young couple comes to the showroom and asks to test-drive one of the luxury models. “What’s your favorite color,” you ask, looking straight at her. 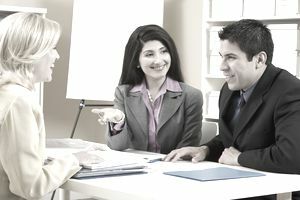 Some people may not be comfortable asking a summary question like those embedded in this sales encounter because they don’t want to look simple-minded or inattentive. If you ask the question exactly the same way you asked it the first time, then they might have a valid conclusion. You also don’t want to ask the same question two times in a row even if you do change the phrasing. By putting some distance between the first time you pose the question and the second, and rephrasing the question slightly, you simply come across as someone who’s really interested in what the other person has to say. You might detect that the person answering your questions seems stressed out; a non-pertinent question could mitigate the tension. Or, maybe you need time to think or refer to your notes, so you use the question just to buy you a little space and time. In asking pointed questions such as, “What project did you undertake in the past that failed?” and “How did you try to fix the problem?” you can easily make a job candidate feel as though he’s in the middle of a battlefield interrogation. You can give the candidate a break by asking, “How long have you coached little league?” before you return to the discussion of his screw-up and how he attempted to fix it. Finally, here are two ways to ruin questions that start off with all the requisite components and end up falling short of good. Not waiting for an answer is also common. You ask, “What’s your favorite meal?” The person thinks a moment rather than responding immediately. You chime in, “Roast beef?” Silence is an effective questioning tool.Don’t lose the discovery, the information, the leads as a result of opening your mouth when you need to open your ears. Remember the “two ears, one mouth” rule of getting the most out of questioning. The above components of communication promote shared meaning when they operate together to deliver a message effectively. The work environment in which those components take place also affects the communication and whether the communication is received. In a work environment that stresses open communication, employee involvement, and common goals, communication more frequent and more effective. But, the expectation for significant communication sets the bar higher in these best workplaces. So, even in high morale, employee-focused work environments, employees complain that they don’t know what is going on. Because of all of the components and the overall environment of an individual workplace, communication remains challenging. The age-old questions about who needs to know what and when do they need to know it is never fully answered to just about anyone’s satisfaction. Employee complaints about too much information, not enough information, and even, information overload, will continue to resonate in workplaces. You will never cure the problem of communication but, with commitment and thoughtfulness, you can increase the effectiveness of both your interpersonal communication and your workplace communication.